Look Up Before Standing Up! Look who's almost done! 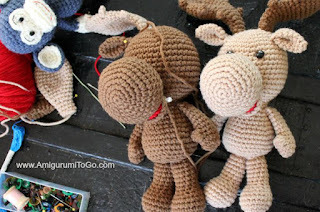 A friend for Jordy the Moose as I test my own pattern. This is the smaller version of my larger moose already available here. I had announced this smaller moose as my next pattern release and the very next day I ended up with a head injury. On June 28th I was sitting on my kitchen floor taking photos of miniatures for my dollhouse page and when I stood up my head had an unfortunate collision with a cupboard door. I hit it so hard that I required stitches to put my scalp back together. I'll spare you the gory details but I got a concussion and also damaged a nerve. For the next 2 weeks I couldn't sit at my computer for too long without getting a nasty headache. I couldn't shop at all. I couldn't go outside and enjoy the sun. I was nauseous and oh so tired! And then on top of that the nerve damage caused severe bolts of pain at random times throughout the day and also in my sleep as it would wake me up. About 3 weeks in the symptoms thankfully began to ease up enough to where I could function for the entire day and not just part of it. I never thought to announce it here or on my facebook page as each day I'd wake up symptom free and think, OH! I'm all better! I'd even tell others that I was all better. But it wouldn't be too long and I'd realize that I wasn't. And each day I'd think tomorrow I'll be better! And then tomorrow would come and I'd say for sure tomorrow I'll be better and the next day the same, haha I was so sure of it. Well, here we are and finally I can say for real that I am so much better. I still have some lingering symptoms but nothing compared to what it was. I'm so thankful! And can I ask you before you stand up off a floor to look up first! One of my friends who had a head injury caused by a car accident told me she has been more mindful of the cupboard doors since I did this to myself. That made me so happy! One good knock on the head might have saved another one from happening. There's always a bright side, right? So remember dear ones to look up before standing up! ohhhh ouch! It's an unbelievable shock to collide with a cupboard! Glad you healed up too. Actually, the doctor that stitched me up said he had collided with a cupboard just days before but he didn't hit so hard, just a little bump. And I've hit one before too and it got my attention but not enough to cause any damage. I suppose it depends on the mission we're on at the time, lol now I'm always closing the doors. I do have one fox pattern. Use the search bar in the upper right corner of this page. One word searches work best. Take all the time you need to get better. Love all of your patterns. .Oh no, that's awful. Glad you're on the mend and I'm looking forward to the small moose pattern to try next. such amazing message, thank you so much! I appreciate all your kind words, they mean a lot. Oh dear, oh dear. Taking photo's is a dangerous business. Never thought it can these big headproblems. Great to hear that you are feeeling much better. Hopefully soon you are totally yourself again. The new friend for Jordy the Moose is looking great. My fault for having the door open. I'm more mindful now and make sure to close them. Wow! Dear ... so happy you´re better again! What a knock out! So please be careful in the future and get all well soon. God bless you. Looking forward to meet your little moose :) Love your patterns! The little moose has been posted. It should be in the top 10 patterns this week section on the right side of this page. Have fun! Glad to see you are on the rebound. Can't wait for Jordy. I have checked your page faithfully everyday for his pattern. I guess I can make it a little longer. Take care. His pattern is now posted :) I hope you enjoy! Omgosh thank goodness your are better and I myself just had major back surgery and thank God,I can walk. Here to our recoverys. I will be doing a lot of crocheting until fully recovered. Love your patterns so much and brightens up my days when I look at all that you've done and for having free patterns for those less fortunate to buy them. I myself am disabled and hard to buy patterns and you are a blessing for people like me ,who makes a difference. Following YouTube and fb too. Oh my goodness, I wish you a speedy and full recovery! Thank you for the kind words, I really do appreciate them. I'm so thrilled to know the patterns are helpful to you.. that means the world to me! I had the hood of my car fly off while driving and hit the roof of my car which came down and hit me in the head. Result... concussion. It took 6 weeks to fully recover. Take your time. Drink lots of water. Eat good fats- coconut oil, avocados, etc., to give your brain fuel to heal. Rest, don't rush it. I'm glad things are getting better for you. It can be scary for something to linger for so long. OH my gosh! That would be so terrifying. Who would ever expect that to happen but freak accidents do happen and I'm SO happy you are ok and recovered! Thank you for the advice, I appreciate it. There's so much to a concussion, one never would realize until they get one. Bless you for all of your hard work. We can all wait while you FULLY recover. Perhaps Jordy's little buddy should have a little bandage on his noggin! Muchas gracias por compartir!!! Sos una persona muy generosa!!! GENIA!! !